Andy: When we first sat down to write this speech, well, we had no idea what to say. Tommy: Everyone always sounds so professional and has a message and point to their speeches. We didn't know what we wanted our "message" to be. Andy: Then my mom said something so simple, yet it worked to calm me down and get me thinking. She said to me, "It's not that big of a deal what you write; it's your time to just go up there and say what you want to say to everyone." Tommy: And so we wanted to take this opportunity, in front of everyone, to say thank you. Andy: As we proceed to thank people, we want to stress that if we leave anyone out, it is not because you were unappreciated. Tommy: It is possible that we just didn't think of it at the time we were writing this speech. Andy: And it's even more likely that we left it out because we just didn't have time to thank everyone without boring you all to death. Tommy: So without further ado, here we go. First off, we want to thank everyone in this gym for coming today and for supporting our class over the years. Andy: We want to thank all the faculty and staff here at West Central. We know that teaching is certainly an underpaid profession to begin with. Tommy: Let alone how much importance Illinois likes to place on its education system. Andy: Thank you mom; thank you dad for all you've done for us over these almost eighteen years. Tommy: We know it can't have been easy, what with there being two of us and all. I mean, that's double the workload. Andy: Not even mentioning the constant bickering and all the fights you've had to break up and disputes you've had to settle. But I digress. Tommy: Thank you to the two lovely ladies sitting behind us for maintaining a 4.0 GPA themselves, particularly Sydney. Andy: Lord knows we're too lazy to have striven for a 4.0 without our competitive nature driving us and the extra thanks for this competitive drive went to Sydney because, well, how can anyone feel competitive or any kind of ill will against Katie Robertson? Andy: To Mr. Henning, for being such a grown up and squirting us with his toy Spiderman water gun thing. Tommy: To Mr. Boyle, for also being a grown up and throwing anything from markers to starbursts to bouncy balls across the room. Andy: To Senora, for putting up with our "awesome" work ethics the last hour of the day all year, and also for occasionally caving and letting us play a round of mafia at the end of class. Tommy: To our good friends, Tyler and Anna for ruining every song on the radio for us by singing their own personal renditions of them every day. Andy: To Brad, for never letting the opportunity to tell a wildly inappropriate joke pass him by. Tommy: To Mr. Davis and Caleb, for being the only people I know that actually look weird without a beard. Andy: To Monica, Marissa, and Catie, for never complaining and always being eager to learn and cooperative in English class. Tommy: And many, many more thanks to many people that we have not yet mentioned because it would take way longer to stand here and say than we would care to take. Andy: Or than any of you would care to listen to. So without rambling on any more, we will turn the mic over to Katie, whom I know has a great speech with an awesome quote at the beginning prepared. Tommy: And then to Sydney, whom I'm sure also has something rather spectacular prepared for us. And I must follow, if I can." Isn't that the truth? None of us know where our life will take us, only that we must press on through the good and bad. Now, as we, the class of 2014, are on the cusp of receiving our diplomas, we are about to open the doors to a new stage in our lives. There are some of us who know for certain what direction we will take, and some of us who may still be uncertain, but no matter what destination we have in our mind's eye, there is still the matter of the road. No one road is the same, and as we depart today, we will each set our feet to our own road. There will be highs, there will be lows, and there will be bumps along the way, but we will have had this in common: each other. In one way or another, we have all shaped each other's lives. We are who we are because we have shared these school years together, and, may I just say, it has been an honor and a privilege to have had such wonderful classmates. Thank you. Four years ago, I gave a speech at our 8th grade promotion where I said that high school was what we were working towards, that it was our time to shine and become better people, and although it is, I was under the assumption that high school was the final chapter, the last step, but now that we have gotten here, it is easy to see that I was wrong. High school is the prologue, and now we have even more to work towards. College, jobs, families, retirement...our lives are building blocks and we just laid the foundation for us to work off of, the rest is your decision. Yes, there will be ups and downs, we'll make bad choices and good ones, but that is how we learn best and move forward. Whether you're going to college, entering the work force, or joining the military, it is up to you to write your next chapter, lay another layer of bricks, just make sure that you are doing something you are proud of, and always know that you have the West Central Class of 2014 behind you, support you every step of the way. 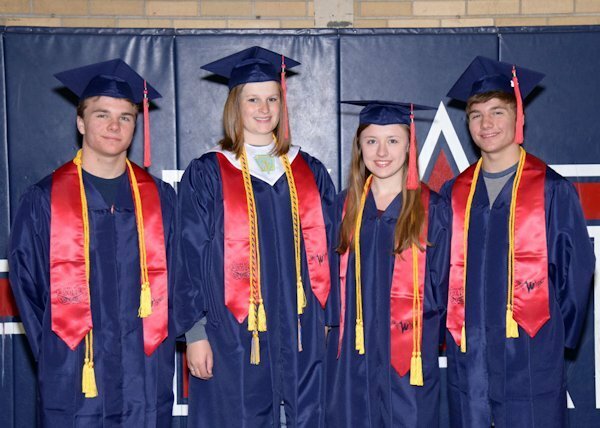 Andrew Lewis, Sydney Bigger, Katelyn Robertson, and Thomas Lewis were named the 2014 West Central Class Valedictorians at Sunday's graduation exercises this past weekend.